Irina Akimova Self-representing artist A beautiful and unique gift for yourself or someone special. 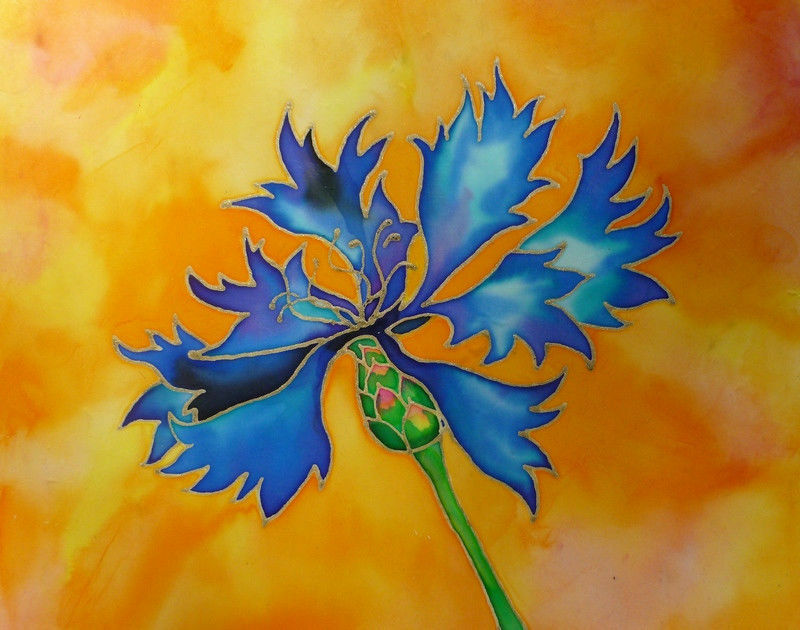 This is a signed silk painting. You have to matted and frame it under glass or with no glass (size of frame 20"x16"). This work of art was created with silk paints on a piece of fabric and sated with iron. I mounted it on a foam board and varnished. The surface is not really flat, but it gives additional effect to the painting. Note that photos may not show exactly the real colors of an artwork. Size of frame: approx. 20"x16"; unmatted; unframed, mounted on a foam board and varnished. More about the artist I was born in Russia, graduated from Moscow State University. In 2004 I went to graduate school at Virginia Tech, and in May 2006 I received my Master's degree in ... mathematics. I have two sons and a daughter and every day try to get time for painting or drawing. If you would like to know more about me and my work, please visit the About Me page. Thank you for taking time to look at my work. Please check my other auctions and feel free to email me with questions. Auction details If for any reason the actual painting does not meet your full expectations, please return it upon receiving it in its original condition and packaging materials. We will refund the full cost of the painting, less shipping costs. The cost of shipping/handling is: within the United States 7.00 (US dollars). I do offer combined s/h discount if you buy more than one item: only 1.00 s/h for each additional item (in a single invoice).